President Muhammadu Buhari's penchant for elevating corruption as the sole, or at least, the main source of Nigeria's problems is already trite. But more importantly, it is a false narrative, apparently so. And the fact that otherwise educated people seem to buy into that narrative is an indictment on scholarship in the country. The president had said in a statement by his Special Adviser on Media and publicity, Femi Adesina that: "PDP has not successfully explained to the country what they did with the money. There were no roads, no rail, no power. They said they spent $16 billion on power, but where is the power?" Certainly, one of the greatest lies of Nigeria is the assertion that corruption - as often defined here - is the country's main problem. Widely held is this falsehood that President Buhari's government has since elevated "fighting" corruption to the status of official government policy. So, they say, we must end corruption for Nigeria to make progress. But the irony stares everyone in the face. Four years of fighting corruption - let's assume the farce going on is corruption fight - Nigeria has become worse off. All developmental indices have headed south. Standard of living has fallen. Nigeria has become the poverty capital of the world with about 90 million of its 180 million people living in extreme poverty. Job losses under Buhari have been massive. So, really, what could possibly be the basis for anyone to keep holding unto such logic? But of course, since "fighting corruption" which was supposed to solve the problems have only created more poverty, we are increasingly being made to accept that poverty is a virtue and being wealthy is some sort of vice. To be clear, the job of government, at the very basic, is to create prosperity, not to spread poverty. However, before the champions of anti corruption cry blue murder. Let me make a few this clear. Yes, I agree that corruption constitutes a hindrance to Nigeria's progress. Corruption is bad, that's not debatable. And as much as possible, we must, as a country, make conscious efforts to put it in check. Nonetheless, my problem with corruption in Nigeria has had to do with what people see as corruption. Of course, if you mention corruption, the mind of the average person quickly runs to political office holders stealing money. That's corruption, no doubt. But stealing is just an aspect of corruption and I dare say, it is about the least worrisome. The worst form of corruption is not stealing, it is nepotism. It is using sentiment - be that ethnic or religious - to put square pegs in round holes. That's one corruption that destroys the fabrics of the society because it doesn't reward excellence. It is one that has helped to destroy Nigeria. And interestingly, it seems to be prevalent in the Buhari government. This brings me to another farce that has dominated the Buhari presidency: integrity. These days, I'm inclined to think that there is a certain physical possession of Buhari that is called integrity. Such that when people say that Buhari has integrity, it could be the same as saying he has a shoe or a car. Because ownership of such physical objects is definite and not dependent on character. If for instance, you have a car, you can rig elections and it doesn't change the fact that you have a car. But that's not the point here. The point is, the idea that Buhari has integrity, and that such integrity - let's not dwell on whether or not there is such integrity - is what makes him the ideal president is hilarious. No, what one needs to lead or to get anything done is skill and competence. I'm yet to see a football club or team going for a competition and instead of gathering the best football players available, brings together people of integrity. A team of players with integrity but cannot play football will lose massively to a team of skilled footballers who are all notorious armed robbers. Running a country is pretty much like running a business. You put the best hands and they will deliver results for the benefit of all. No country can progress when the first consideration for appointment into position of responsibility is not competence, but religion and ethnicity. Nigeria's failure doesn't therefore, come as a surprise. And the ugly truth is that the country will keep failing spectacularly and the rest of Africa will leave us behind. It is already happening. The subject of my article is corruption and I shall return to it presently. I don't think that there is any country on the planet where corruption does not exist, even in Europe and America. But the existence of corruption has not stopped countries in those continents from making progress. Even though we might say it has slowed some down - with examples in Eastern Europe - but even in their slow progress, they are still paradise compared to Nigeria with its massive human and mineral resources. I have joked elsewhere that Nigeria basically functions as a criminal enterprise. 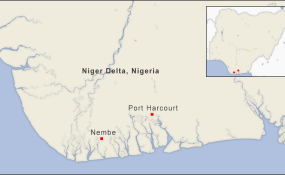 It is a country sustained largely by oil revenues from the Niger Delta. The discovery of oil had prompted the enactment of the obnoxious law that cedes all resources beneath the soil to the federal government. Such that whoever constitutes government at any point in time reserves the right to control such oil resources. Take away all the nuances and grammar, Nigeria is a country built around looting oil resources of the Niger Delta and sharing the proceeds. I call it looting because there is no kind of democracy that allows you to take what is in someone's land and share amongst yourselves. None that I know of. The business of government is regulation and taxation. This brings me to the question of what really is Nigeria's problem if not corruption? The answer is simple. It is structure. The first assignment of any leader who genuinely believes in Nigeria, and who wishes the country well, is to quickly devolve power to federating units. Whatever will constitute those federating units; whether states or zones, is a matter of details. I'm not saying that structural change is the magic wand that would create prosperity and propel Nigeria from third world to first world country in an instant. To be sure, there would be initial challenges. But doing so would mean that we are on the right path; the path to sustainable development. If for instance, the Borno State government had to, as a matter of necessity, look inwards because it receives no freebies from Abuja, I'm convinced that the vast amounts of arable lands in the state could have been put to profitable use. And there could have been thriving leather and milk industries in the state on account of cattle breeding. This way, a vast majority of the state's populace would have been engaged. There couldn't have been Boko Haram. The idea of creating alternative sources of revenue - or diversifying the economy - will remain elusive as long as the feeding bottle federalism remains. It's been the same talk since the 80s, as much as fighting corruption has been the justification for changes in government since the days of military dictatorships. Obinna Ezugwu is a journalist based in Lagos. ezugupatricko@gmail.com.